Our after abortion survey will help you determine if you could benefit from one of our free online recovery courses that you can take at your own pace, right where you are, absolutely free of charge! 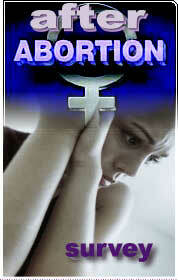 Every abortion involves first a man and a woman. The procedure may impact the woman, but the loss of the baby can and often does hurt the man. It can also impact the extended family of brothers, sisters, aunts, uncles, and grandparents. This free after abortion survey is provided by Last Harvest-The Outreach, who has served the after-abortion movement since 1985. The purpose of this survey is to help you define the actual nature of the hurts (if any) you may be experiencing. Every survey result will be emailed to you immediately. Our office will follow up with an analysis of the results by email, with your permission, of course. We know many of our visitors realize they do suffer deep emotional hurts because of the past choices they have made or choices of others that were made for you. If you are hurting right now, take a deep breath and move to one of our helpful recovery support sites.